Bill deBlasio has declared that he is planning to vote for Andrew Cuomo on the Democratic ballot line rather than the Working Families Party line which he was instrumental delivering to the governor despite his first term being an obstructionist opposed to the WFP agenda. The mayor, having the veneer of being the progressive darling, has been the face of WFP for their 2 mailings (that I have received so far) to encourage voters to cast their vote for Andrew Cuomo but on the WFP's line. If the mayor refuses to vote on the WFP, then why should anyone else? Why should the deal that Cuomo agreed to to get the WFP ballot sway any left-of-Cuomo voter if everyone involved in the deal has abandoned the WFP? Campaign finance, the only systemic reform that was a tenet of the agreement, will certainly be the thoroughly tossed onto the trash with or without a massive electoral turnout for the WFP. The NY DREAM Act, minimum wage increase (though probably not pinned to inflation), and declarative right to an abortion will be pointed to as the WFP deal being consummated to the satisfaction of Cuomo, deBlasio, and the coalition partners that make up the WFP. What Bill Lipton and Dan Cantor (state and national directors of the WFP respectively) can claim as a victory, but no one who has put a significant amount of thought into it, that anything else other than whacking at the leaves and surrendering to plutocracy rather than earnestly challenging the status quo; to accept that 'it's just the way things are' that one individual with a million dollars is of greater value than the lives of a million sorry souls. Imagine if the WFP deal was just campaign finance, and without the far more achievable but laudable goals that I expressed would be passed in Cuomo's next term. That as a condition of the WFP deal an explicit amount of money was declared to induce voters to vote the WFP, and that campaign finance reform be the central issue to his campaign. Cuomo would have likely balked at such a deal, since there was no viable escape clause but that it being so ironclad should have been the purpose. The two possible outcomes would been that the WFP would have been left with Zephyr Teachout as the nominee though the unions that pay the bills would have bolted from the party but the Democratic Primary would have still occurred only with Teachout continuing on in the general election challenging the incumbent governor to answer criticisms from the left; alternatively had the WFP been able to narrow the deal to just campaign finance reform then Cuomo could have only one metric to be judged on whether he kept his side of the bargain passage and funding Fair Elections, no half measures or partial victories to be claimed as face saving feats. Democratic takeover of the State Senate in either scenario would have been inevitable, either by the influx of voters in the general election given a real choice between status quo candidates and a truly viable insurgent in Teachout or Cuomo deliver on this new hypothetical deal and transfer of the set amount of campaign cash to WFP to target not only the open seats in the state senate but towards the challengers of incumbent Senators who voted for Majority Leader Skelos (including the IDC senators). Even if the senate isn't taken over by the Democrats (who already hold a majority of seats, and only due to the IDC are in minority) in 2014 the Democrats would win the senate and eventually make the IDC irrelevant in 2016 or 2020 presidential election. Kathy Hochul, former Congresswoman from the Buffalo area and first time candidate for public office without the endorsement of the New York State Conservative Party, is running for Lieutenant Governor with incumbent governor Andrew Cuomo. In the Democratic primary liberal lions (Rep. Jerry Nadler, Mayor DeBlasio, etc) circled the wagons around Hochul to protect her from the accurate claim that she is a conservative Democrat. The New York Observer yesterday reported that from her release of tax information she has made donations to a Texas evangelical preacher whom has had a long career of unambiguous hatred of abortions and has never been welcoming to birth control of any sort. As the highest female running on the Women's Equality Party ticket (the party name which is misnomer since 7 men are running on the ticket and only 3 women) this is embarrassing to say the least since raison d'etre of the party is to pass the tenth point of the 10 point Women Equality Agenda of unrestricted access to abortion as a legal right in New York State. Andrew Cuomo has been airing ads to encourage people to vote for him and Hochul on the WEP ballot line assuming that vast majority of the electorate will vote for him on the Democratic party line without prompting. 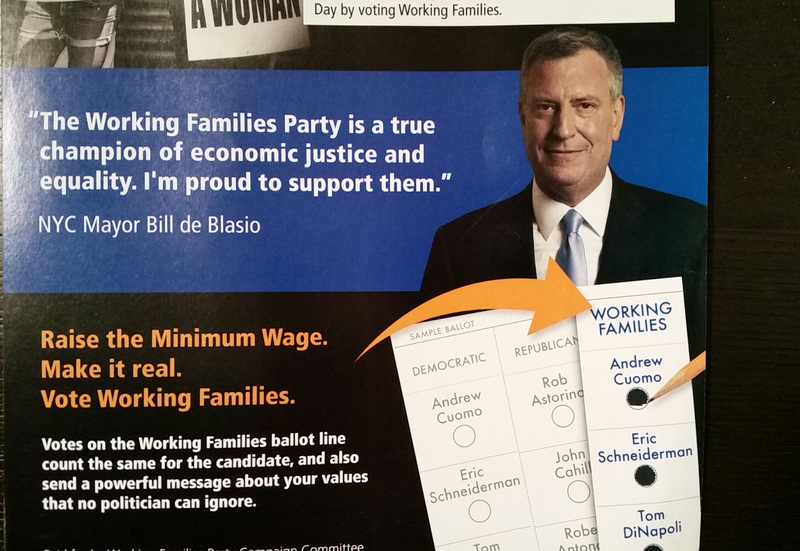 Which begs the question, if Andrew Cuomo doesn't intend to vote for himself on the Working Families Party, nor respect the Deblasio negotiated deal that landed him the endorsement of the WFP why should anyone else? Why should a deal that was dismissed by the governor even before newspapers had a chance to put the story to print be honored by the activists and high info voters that typically vote WFP? Should the 142,000 voters that voted for Cuomo on the WFP line in 2010 return the favor in 2014 when there was not even lip service paid to keeping the commitments of the deal that delivered WFP line, and a clear path to an unobstructed general election, just to say "at least progressives have a seat at the table"? To think that WFP has any influence, when the governor whose social policy has been adequately to the left but whose economic policy has been pure voodoo supply side and tax cuts for the wealthy and public service cuts for the rest, currently is being snookered by the top of the ticket actively working against the WFP with his own alternative faux reform third party is delusional. Though it is unlikely to be anything but a coronation of King Cuomo to another term in office, thoughtful progressives or anyone that is concerned with integrity of our elected officials should withhold their vote from either of the major candidates and vote for a 3rd party this November. For those New York State voters that are left of the aisle Green Party candidate Howie Hawkins; for those on the right Libertarian Party candidate Michael McDermott. Broken Window Theory, How About Implementing Broken Mirror Theory? The "Broken Window Theory" is that small crimes being let to continue in a community without a response from law enforcement will eventual create moral hazard and an escalation to more significant crimes. So hundreds of thousands of law abiding citizens are routinely harassed (overwhelmingly represented by young men and boys of color) for the sake that they don't progress into a life of crime or their criminal activity ends with marijuana possession; it is counterproductive to destroy the potential future of huge swaths of the young men and boys of color for the sake of those that may only have the the only victim-less crime of smoking pot. If it was the best strategy for the community to cracked down hard on the slightest little crime, then wouldn't it beneficial to so for every police department? Shouldn't we expect that police never speed without getting a speeding ticket (their squad cars could equipped with GPS devices)? Every incident of improper arrest, search, or other on the job action could be a strike on their record, three strikes and they off the force without their pension. If we can only assume that citizens should always be within the law, shouldn't those that are entrusted to enforce the law also follow the law and the committed to remain within stated department policy? Shouldn't even the smallest infractions of policy be rooted out from every police department, shouldn't there zero tolerance for every police officer to remain true to purpose of the Broken Window Theory be held to the same standard? It is expected throughout American society, that cops because their jobs are given a certain amount of leeway (more likely that they simply take it and rationalize it afterwards), but if the police are free to cut corners of the law for the sake of pragmatism or laziness then they abdicate any benefit of the doubt when their integrity is called into question. Police brutality as an issue has always been with us, but only has been brought to the light in recent years due plethora of cameras both surveillance and individuals' mobile devices has captured a larger portion of everyday life. For people of color police brutality and the assumption of guilt has been part of daily life. To have police operate under the presumption that the communities of color if they were leading lives wholly within the law, should have nothing to hide when they interact with law enforcement is logical farce and couched in systemic bigotry. No American citizen has any obligation to persuade the government, its agent, or any law enforcement officer that they are innocent of committing a crime, the onus is entirely on the government every step of the way to enter the lives or even cause the smallest disruption of life. If police officers and police departments want to intrude on anyone's person or personal possessions, without the presumption of innocence either work to repeal the Fourth amendment or seek out a new live of work. Even if the fourth amendment was repealed (as unlikely as that is) the benefit of the doubt for the public employees doing the right thing on a day-to-day basis would need to be won back. Law enforcement officers who would want to maintain getting paid would have to above reproach, and be held to the highest possible standard; absolutely zero tolerance for breaking even most minor infraction and traffic violation on or off duty. If the hegemony would become transformed from the assumption that cops the country over are lax when they fudge the law to the belief out of consistent observed reality that they pay parking tickets, speeding tickets, and are assumed that if there is an accusation against them that there fellow officers will ferret out the truth and never reflexively defended regardless of the situation of their "boy in blue." Some will read this as being far too critical of the local policeman, but that innate sympathy is misplaced, because currently in most American police forces there is no threshold where 'bad apples' are undeserving of rounding up the wagons to protect one of their own. Independent of the facts of individual situations, the 'bad apples' of law enforcement agencies are very rarely called to be held responsible for their questionable actions therefore either every cop has nothing but good intentions in their day-to-day policing or those that do have good intentions (and I'm referring to the vast majority of police) are throwing away their integrity for the sake of the bullies with badges. If even the supposed good cops can't proceed with their job while remaining well within the rules, then there is no hope for the citizens they attempting to police. One police officer is one too many that needs to be educated about the law they are supposed to be enforcing. This cop is schooled about his legal obligation to have a marked car unless operating undercover, which he admitted he was not. I have known Alleyn Harned for 10 years and have counted him as friend for all those years. I have zero reservations in endorsing him in his run for City Council of Harrisonburg, VA.
Alleyn is a smart, hardworking, committed, individual who bring integrity and fresh new ideas to local government. He is a great champion of renewable energy and would strive to make sustainability a top priority in his tenure as City Councilman. If you live in Harrisonburg, VA, or know of friends and family that do, please go out to vote November 4th, or encourage your friends and family to vote for Alleyn Harned for city councilman. I am the schnook that took this picture in 2004. I'm a schnook because I didn't think of getting my picture taken with the future president as well.